Longtime Resident of New Berlin. Passed to eternal life Saturday November 3, 2018 age 65 years. Devoted husband for 45 years of Karen (Nee Schendzielos). Loving Dad of Eugene John (Becca Pfenninger) and Tracie (Tim) Heyrman. Proud Grandpa of Alexander Brah, Griffin Bianchi, Amelia and Huck Heyrman. Brother of Addie (James) Lackovic, Charles (Jelaine) Brah, Diane (James) Albiero and John (Mary) Brah. Son-in-law of John Schendzielos. Brother-in-law of Daniel Schendzielos, Carleen Schendzielos, Tom (Kerry) Barrett and Christine Schendzielos. Also survived by nieces, nephews, other relatives and many friends. Visitation will be held on Saturday, November 10, 2018 at Mother of Perpetual Help Parish (2322 S. 106th Street, West Allis) from 11-2:00pm with a Mass of Christian Burial at 2:30 pm. Deacon Gene was ordained as a Permanent Deacon for the Archdiocese of Milwaukee in 1994 and proudly has served the parishes of St. Elizabeth Ann Seton, New Berlin, WI and Valparaiso, IN, St. James Parish, Mukwonago, WI, Mary Queen of Heaven Parish, West Allis, WI and currently serves at Mother of Perpetual Help Parish, West Allis, WI. 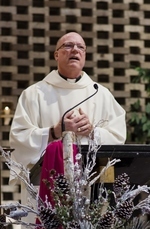 During his time as a Deacon, he has assisted in many marriage preparation and baptism classes, funerals, weddings and baptisms, communion services, Inner City Ministry, Hispanic Ministry, Prison Ministry, and working with the Youth of the parishes he has served. Deacon Gene enjoyed his ministry to the church and was humbly touched by the many people he was honored to work with. Gene devoted his life to independent pharmacies and enjoyed time with family and friends golfing. During the past few years Deacon Gene served proudly as a Chaplain for the West Allis Police Department. He gave a lasting gift of sight thru his donation to the Eye Institute. In Lieu of flowers memorials to the Catholic Relief Services appreciated. Steinke-Lazarczyk Funeral Home and Cremation Services of Lake Geneva, WI is proudly serving the Brah family. To send flowers to the family of Deacon Gene D. Brah, please visit our Heartfelt Sympathies Store.